A cultivar of Camellia japonica L. Its flowers are up to 10cm across, a very delicate blush colour, almost white, striped and spotted with pale rose. The outer petals are nearly round and flat, the inner ones irregular, arranged in a loose cluster. [ICR]. Probably first illustrated with the name ‘Gray’s Invincible’ and raised in 1824 by George Press, gardener to Edmund Gray of Hornsey, ‘from seed of the semi-double red (‘Semi-duplex’), impregnated with the single white (‘Alba Simplex’).’ [BR f.1267/1829]. ‘Its beautiful flowers are produced at the same season as the others of this superb family, now become so very numerous.’ [LBC no.1745/1833]. Listed in all published catalogues [T.254/1843]. Macarthur reported that ‘Punctata’ was ‘very scarce and difficult to increase’ in a letter to John Bailey of Adelaide on 16th July 1846. [MP A2933-2, p.174]. See also Camellia japonica ‘Pressii’. 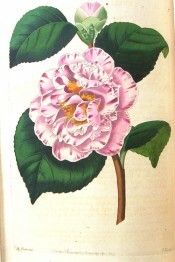 Berlèse relates Camellia punctata to ‘Press’s Eclipse’. ‘247. C. Gray Venus. 248. C. Gray. 249. C. Eclipse. 250. C. Splendida. 251. C. Venusta. 252. C. Punctata plena. – All these Camellias are sub-varieties, which resemble each other so much, that it is better to consider them as a single one. All these double denominations come to us from beyond the sea. 253. C. Punctata plena. – Shrub vigorous and of an elegant port; leaves oval, almost round, two and a half inches wide and three and a half long, with very prominent nerves, much dentated, of a deep green; bud large, depressed at the summit, with apple-green scales; flower three inches in diameter, full, ground rose, marked with cherry-red lines, No.1; petals of the circumference broad, crenate at the summit, and convex; those of the centre small, elongate and erect; floral form of C. Imperialis, but the mixture of its colours renders it more apparent. This Camellia sometimes produces flowers, entirely red or rose, and without stripes. We think that C. Preston [sic] Eclipse is identical with this, and that this accidental variety has been established by grafting. – Magnificent.’ [Berlèse Monography p.90/1838].